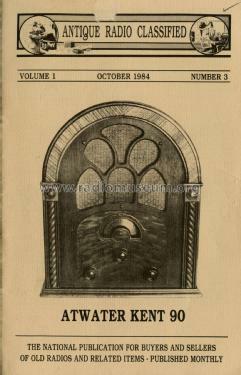 Antique Radio Classified (ARC) is or was a monthly collector journal which is known as a source of collector prices from auctions and swaps, also describing them. Each issue contained articles on various items of interest to radio collectors (models, history, collecting, etc) and a classified ad section, where sellers would offer radios and related items and collectors would post want ads. The magazine ceased publication in May 2013, but resumed in February 2014, only to stop again in June 2014. Financial and marketing issues were cited as the cause. However, an "on-line only" edition was started in February 2017. The first issue of ARC started with 16 pages including cover pages as a free example to find out if it can be started for September 1984 as Volume 1, Number 2. This shows 20 pages. The regular monthly issues came later (volume 2, 1985) with 24 pages. March 1986 was the start for 28 pages but with a notice that A.R.C. will cease publication if not more than the (present) 1200 subscriptions can be reached and the yearly cost would have to be risen from $ 15 to $ 18. Fortunately G.B.S. Enterprises, 9511 Sunrise Blvd., J-23, Cleveland, Ohio 44133 could continue. Founder, publisher and editor was Gary B. Schneider. December 1986 the journal contained 32 pages - until May 1987, which issue shows 36 pages. June 1987 even went up to 44 pages and its topic was the restoration of a Marconi Multiple Tuner. I could state this only because of a dear guest from the USA who was willing to scan the pages without ads, including the back cover page for the first volumes up to June 1987. This shows the interesting start and growth of this journal which was also sought of because of the reoprts including prices from auctions and swap meets etc. Below you see at least the cover page of all issues up to April 2014. Member Robert Rydzewski, USA was writing down the topics for quite a number of issues and we show the number of his entries with figures at each issue. This is indexed by Google and helps all owners of such journals to find articles, photos etc. - specially in case that one remembers having seen something in an issue but in which? All this is a lot of work and we would need more guests (can get a free membership) and members who participate for this and other literature. Completion can be done in several ways including PDFs with OCR recognition, direct texts (like this one), pictures or indexing single topics. Specially club journals can get more subscriptions if they present their ournal here, but i recommend to publish such PDFs with OCR recognition only for the older publications, say older than two or three years, like this sample from an Austrian club (in German). Later, members can even click on different literature to get a small document for each literature to write down some data on a "private card" or select the place of storage (building, room, bookcase etc.). The member can then look up or print out a list with the main data and he/she can decide wether other members or even other guestas may know that he/she owns it - for helping out in special cases of rare literature. At least for German speaking literature you find about 5000 books stored at GFGF and you can write directly to the archive. I think it would be interesting if AWA or other organizations dealing with antique radios and related would do the same here. When we get permission, we will upload one sample of the electronic issues which exist now for ARC. To my knowledge, ARC did not publish a paper or electronic edition from May 2013, vol 30-5 through January 2014, vol 31-1. Publishing restarted February 2014, vol 31-2. I cannot verify if 31-2 was paper, There is at least electronic editions 31-2, 3 and 4. I could not get answers from Jon Kummer, the present owner, also not a year ago when I wanted to meet him in the USA. I offered help because I could write to more than 5000 of our English speaking members, most of them from the USA because I'm sure that collectors would like that this journal can continue. ARC is now the first magazine for which I try to reach a certain completeness as a sample of this new application (in progress). We still have to program a lot for the Literature Finder (a link on our HP). Click here for the 15 models documented in this literature, i.a.